Bo Sun successfully completed her PhD trial lecture on Monday, the 11th of June 2018 and thesis defence on Friday, the 22nd of June 2018 at the Department of Informatics, University of Bergen and will be awarded the degree of Doctor of Philosophy. The title of her thesis is “On Classification and Some Properties of APN Functions” and the given topic for her trial lecture was “Differential cryptanalysis”. First opponent: Dr Marco Calderini, Researcher, Department of Informatics, University of Bergen, Norway. Second opponent: Dr Lars Eirik Danielsen, Senior Consultant, Miles Bergen AS, Norway. Committee member: Dr Marco Calderini, Researcher, Department of Informatics. 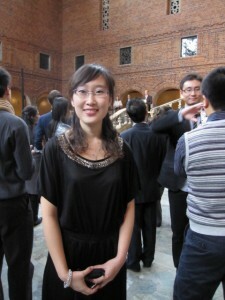 Bo Sun carried out her PhD work at the Department of Informatics, University of Bergen. Her supervisors were: Dr Lilya Budaghyan, Department of Informatics, University of Bergen, Associate Professor Nian Li, Faculty of Mathematics and Statistics, Hubei University, China and Associate Professor Chunlei Li, Department of Informatics, University of Bergen.